Use Candles – But Stay Safe! A neighbour of mine lost her 125-year-old heritage house – and a beloved family pet – in a terrible house fire. She was extremely lucky that no one else in the family was hurt, after everyone fell asleep, leaving a tea light candle unattended in the kitchen. If you make or use candles, you MUST learn how to use them responsibly and take proper safety precautions to protect yourself and your family. One common cause of house fires, and deaths or injuries due to house fires, is falling asleep (or simply not paying attention) while a candle is burning. If you forget about a candle that is lit then you run the risk of a breeze from an open window, air conditioner or furnace duct blowing a curtain or a stray piece of paper into the candle flame. This is what happened to my neighbor who lost her house! Other things could also happen to a lit candle when you are preoccupied or unaware of the danger – a pet moving around could overturn the candle. Or the wax could overflow the candle holder and ignite, then set fire to the table or surrounding materials. Why take these unnecessary risks? The following free candle safety tip sheet contains essential safety advice for anyone using candles. Always keep candles in containers specifically designed for candle burning and only burn candles on heat resistant surfaces. Always protect your candle from debris. Candles filled with debris such as dust and pet hairs are less likely to burn evenly, which can cause the flame to flitter and possibly spark a fire. Burn candles away from drafts. A draft could push the flame too close to burnable material, thus causing a fire. A draft will also cause your candle to burn unevenly, drip and smoke. Trim wicks down to ¼ inch before lighting. It’s always best to start with a clean wick. Using a used, blackened wick that was previously burned will cause a brighter, stronger flame that could easily ignite a fire. Since heat rises, never place lit candles under items that could easily go up in flames such as lampshades, plants, or curtains. Distinguish candles after they have been burning for an hour straight, thus giving the hot liquid wax a chance to cool. 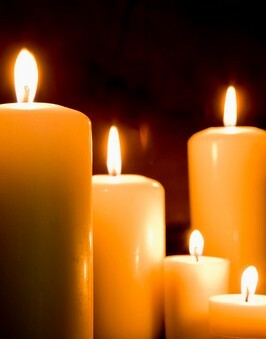 Refrigerate candles before using, as they will burn more slowly and evenly. Wrap in foil or plastic before refrigeration to prevent wicks from absorbing moisture. Extinguish candles when they get within 2 inches of their holders or decorations. When extinguishing a candle, hold fingers in front of the flame and blow at it. The air will flow around your fingers and extinguish the flame from both sides, or use a candle extinguisher. This will prevent hot wax from splattering and your wick from falling over. Don’t place candles at arm’s reach of children, who can easily knock over a candle.